Jannelly Rangel rewrote the Lindsay girls soccer record books when she scored nine goals in a single game on Jan. 8 in Lindsay. Not only did Rangel break a school record, she also led her team to a 10-0 victory over Corcoran in the opening round of East Sequoia League play. Rangel broke the record that was previously held by her cousin Brenda Rangel who graduated in 2005. “It is really special to have broken her record, everyone who knows my cousin knows she was amazing. And for me to break it, it is such a big accomplishment,” said Jannelly Rangel. Heading into that game, Jannelly already had it in her head that she wanted to break her cousin’s record and to leave her mark on Cardinal soccer. And Jannelly made sure early on she put herself in position to break the record. In the first half Rangel scored four of her nine goals and quickly scored another two early on in the second half. With the Cardinals up 6-0, her coach moved her down to sweeper. 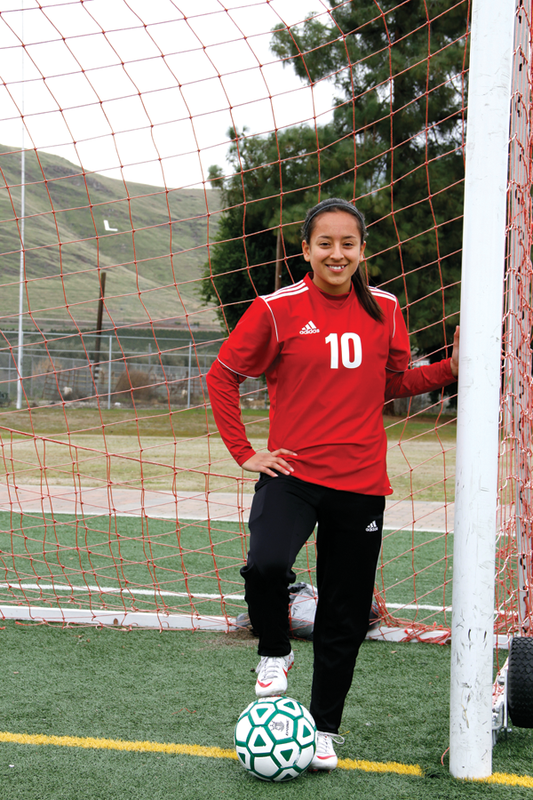 Rangel convinced her coach to move her back to forward so she could make a run at history. “After my seventh goal I looked at my coach and asked if I had broken it yet, not remembering how many I have scored already,” said Rangel. With Rangel two goals short of the record, her teammates did all they could to get her into the record books. Even though Rangel is in the record books with the most goals scored in a game, she says without the help of her team it would not have been possible. “Everything started from the back, from our goalie onto our middles and our forwards. Without them the score would not have been what it was,” said Rangel. Rangel admits she did not realize she had broken the school record until her coaches were yelling out to her that she had done it. “It felt really good, because every time my cousin would ask me how many goals I scored I would always say six. Brenda would always tell me that I could not beat her record. And that night I got to finally tell her I beat her,” said Rangel. Rangel says her next goal is to beat her own record of nine goals and also her sights are set on breaking the season record which is 38. Rangel is sitting at 18 goals on the season with eight games left to play. For Rangel to break that record as well she would have to score at least three a game for the rest of the season. The Cardinals will be back on the field Thursday, Jan. 17 against Farmersville. Game time is set for 6 p.m. in Lindsay.